Tal-y-Bont: Accommodation, Attractions, Activities, Going Out, Shopping, Things to Do, Places of Interest, Outdoors, Tal-y-Bont Holidays, Tal-y-Bont Area Location, North Wales. Tal-y-Bont is a village in north Ceredigion. It is located on the A487 main road, about halfway between Aberystwyth and Machynlleth. Welsh is the first language of the majority of the population. The village stands on the Adfon Leri and Afon Ceulan riversides in the area of Genau�r Glyn at the foot of the Ceulan Maes-mawr. There are many old silver and lead mines and woolen mills surrounding the village. Tal-y-Bont is the main village in the community of Ceulan-a-maesmawr which has a population of a little over a thousand people. There is also the small village of Bont-goch which lies in the upper valley of the river Leri, some three miles from Tal-y-Bont. In addition to the two villages, the community has a number of large and small farms. The village is family friendly and a very popular tourist destination. Tal-y-Bont developed over the nineteenth century to serve the agricultural sector and as a centre for the wool and lead industries. In 1998 a wind farm was built on the hills between Both-goch and Tal-y-Bont. Tal-y-Bont has a Post Office and shop on the main road of the village, and Italian Restaurant called Tony�s, and a riverside pub and restaurant (The Ysgethin). There are more shops towards the beach and two more pub restaurants, Henry�s bar and The Sands. Both have regular entertainment and are open to the public. Tal-y-Bont is a good starting point for walking, cycling and fishing (both fresh water and salt water). Near the beach there is an amusement arcade, as well as bingo and somewhere to get fish and chips. There are several businesses, two chapels and a church, and a thriving community school. Tal-y-Bont is a good place to stay if you�re visiting the Barmouth area, and has plenty of train and bus service. 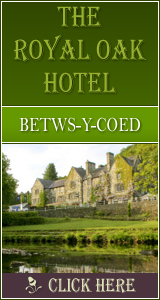 Talybont Hotels North Wales UK Find Hotels Accommodation in Talybont.